The key step in editing an organism’s genome is selective targeting of a specific sequence of DNA. Two biological macromolecules, the Cas9 protein and guide RNA, interact to form a complex that can identify target sequences with high selectivity. 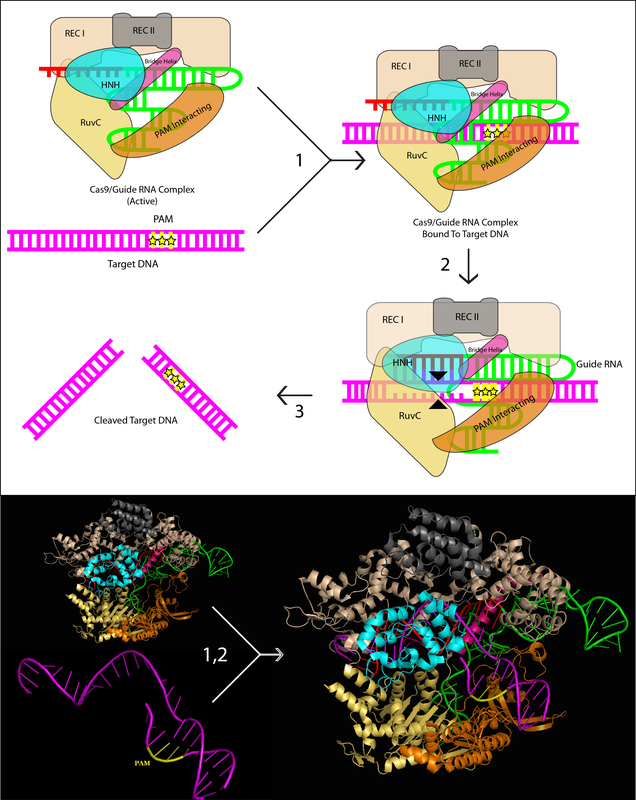 The Cas9 protein is responsible for locating and cleaving target DNA, both in natural and in artificial CRISPR/Cas systems. 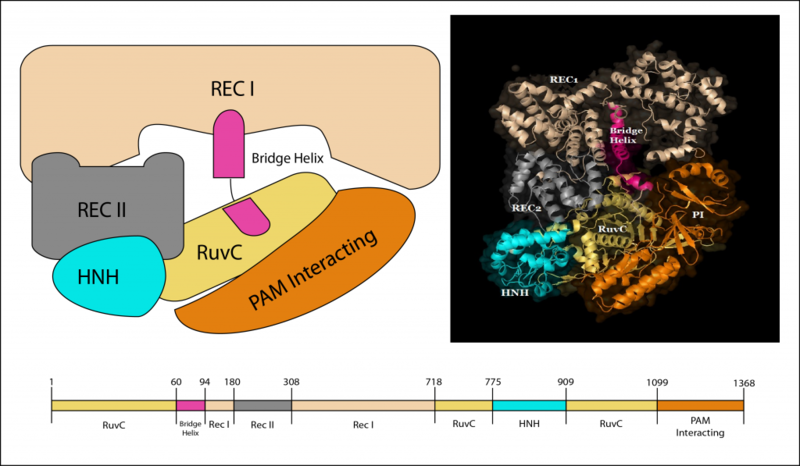 The Cas9 protein has six domains, REC I, REC II, Bridge Helix, PAM Interacting, HNH and RuvC (Figure 1) (Jinek et al. 2014; Nishimasu et al. 2014). The Rec I domain is the largest and is responsible for binding guide RNA. The role of the REC II domain is not yet well understood. The arginine-rich bridge helix is crucial for initiating cleavage activity upon binding of target DNA (Nishimasu et al. 2014). The PAM-Interacting domain confers PAM specificity and is therefore responsible for initiating binding to target DNA (Anders et al. 2014; Jinek et al. 2014; Nishimasu et al. 2014; Sternberg et al. 2014). The HNH and RuvC domains are nuclease domains that cut single-stranded DNA. They are highly homologous to HNH and RuvC domains found in other proteins (Jinek et al. 2014; Nishimasu et al. 2014). The Cas9 protein remains inactive in the absence of guide RNA (Jinek et al. 2014). In engineered CRISPR systems, guide RNA is comprised of a single strand of RNA that forms a T-shape comprised of one tetraloop and two or three stem loops (Figure 2) (Jinek et al. 2012; Nishimasu et al. 2014). The guide RNA is engineered to have a 5′ end that is complimentary to the target DNA sequence. This artificial guide RNA binds to the Cas9 protein and, upon binding, induces a conformational change in the protein (Figure 3). The conformational change converts the inactive protein into its active form. The mechanism of the conformational change is not completely understood, but Jinek and colleagues hypothesize that steric interactions or weak binding between protein side chains and RNA bases may induce the change (Jinek et al. 2014). Once the Cas9 protein is activated, it stochastically searches for target DNA by binding with sequences that match its protospacer adjacent motif (PAM) sequence (Sternberg et al. 2014). A PAM is a two- or three-base sequence located within one nucleotide downstream of the region complementary to the guide RNA. PAMs have been identified in all CRISPR systems, and the specific nucleotides that define PAMs are specific to the particular category of CRISPR system (Mojica et al. 2009). The PAM in Streptococcus pyogenes is 5′-NGG-3′ (Jinek et al. 2012). When the Cas9 protein finds a potential target sequence with the appropriate PAM, the protein will melt the bases immediately upstream of the PAM and pair them with the complementary region on the guide RNA (Sternberg et al. 2014). If the complementary region and the target region pair properly, the RuvC and HNH nuclease domains will cut the target DNA after the third nucleotide base upstream of the PAM (Anders et al. 2014) (Figure 4). Hi, I’d like to use (adapt) these figures for my thesis introduction – how should I cite you? Thanks! 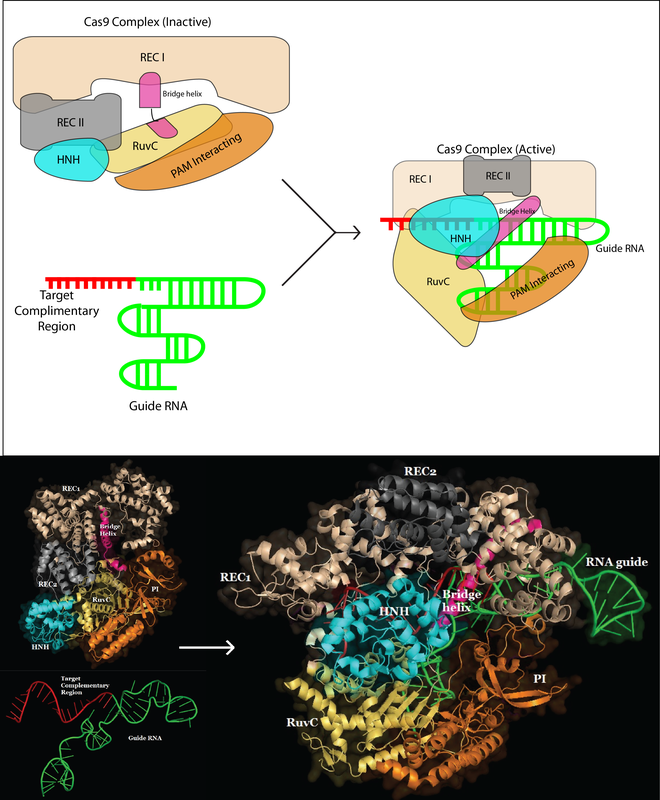 Cavanagh & Garrity, “CRISPR Mechanism”, CRISPR/Cas9, Tufts University, 2014. We’re very glad you appreciated the images! However you want to cite them is probably fine, if you change them you can say “adapted from” at the beginning. Good Luck! This entire explanation of the CRISPR/Cas9 system is fantastic. I have linked it to my learning management system as required reading for my undergraduate Genetics class – and plan on using (and citing) your figures in my lecture. Thank you so much for this great work! We are revising the Cas9 entry in the Wikipedia. You could of course also do this too. If you put your diagrams (e.g. Fig 1) up, we could incorporate them into the entries (possibly with some modification). I think they would make a great addition. Thanks for the explanation, It’s really clear and helpful. First: Thank you for the helpful information. Excellent explanation,very simple ansd soo precise. Very nicely explained. Thanks a lot! Thank you for the detailed explanation. I’ve one query though. If PAM sequences are specifically found only in invading bacteriophages, then how is the CRISPR system applied in other organisms which do not have PAM sequences? Like in mice etc?? Great explanation! I was wondering- is the gRNA sequence removed from the target region after it is annealed to initiate cleavage? That is, is the annealing transient? Thank you for these simplified explanation. Great Explaination. It would be more helpful for the newbies if you can include some animations/videos about the CRISPR/Cas system in it. does CRISPR return to normal after cleaving the DNA? Does it remain in its cleaved formation? I think the spelling in the illustration of the gRNA is ‘complementary’ as opposed to ‘complimentary’. But that’s trivia, this is a great article. Some really choice content on this website, ssaved to favorites. women think. Also, thanks forr allowing me to comment! such designated about my trouble. You are amazing! Thank you! Normally, Cas9 from different species recognize different PAM. Do they cut DNA at the same site (3-4 nucleotide upstream from PAM)? Does anyone know the molecular mechanism of crispr AS AN ORGANIC CHEMIST WRITE A CHEMICAL MECHANISM? thank u for your comprehensive demonstration, but i also wonder how CRISPR system activates genes, could u show me a further illustration if that doesn’t bother u?